The rifled musket in the civil war revolution or evolution? Based largely off the following books. During the civil war not everyone had a fully functional rifled musket. Many primitive and sub standard weapons were used. For a extreme example Pikes and Bowie knives were used early in the war, rocks were thrown when men ran out of ammo. Confederate forces in Missouri were forced to surrender after a skirmish with the more numerous Indians inflicting causalities with bow and arrows. A Texas regiment charged union lines in New Mexico armed only with spears. Arrows, war clubs and lances were used in fighting with Indians. The sword and bayonet still played a role in civil war casualties. Saber charges were made until the end of the war. Successful Calvary charges with swords even on entrenched, rifle pits positions, were successful even as late as march 1865 when the 17th Indiana did so with great success. Neither side could equip its army fully with the new refiled musket. The CSA started with only 10% equipped with the rifled muskets. In July 1861 Tennessee troops were armed 69% flintlock 20% smothbore 11% rifle. At Shiloh Alexander Stewards brigade had 53% smothbore and 103 flintlocks. The CSA army of Tennessee in august 1863 was equipped with 36% smotthbore and 12% substandard rifle musket. The same army in June 64 12% still had smothbore. The rifle musket had better specs than that of the smothbore especially in regards to range. Theoretically it was a Superior weapon, though in combat during the civil war, its advantages were often negated. The smothbore buck n shot within 100 yards was considered equal or better than mini ball within that range. The rifle was “Claimed not proven to be better aim” within the range of the smothbore. Some generals north and south reused to “upgrade” to the rifle musket from the smothbore. Individuals, entire regiments, and generals kept the smothbore over the rifle believing it to be a better weapon. It was not a universal opinion that the riffled musket performed better. "It is difficult to find any evidence at all to support the suggestion that Civil War musketry was delivered at ranges much longer than those of Napoleonic times...Civil War musketry did not ... possess the power to kill large numbers of men, even in very dense formations, at long range." The average combat range in Napoleonic wars using the smothbore was around 70-100. It was thought by many because the rifle has much greater range, the combat of the civil war must have been at far greater distances. However even in modern wars such as ww2, Korean and Vietnam [Slight less] all averaged small arms fire around 100 yards. The rifled muskets performance in battle, was not significant changed from the smothbore, neither were its ranges “Although the theoretical range of the rifled musket was several times that of a smothbore, much of the fighting nevertheless occurred at ranges equal to or only slightly more than that found during previous wars.” It was hard to see a man 200-500 yards off, even more so in the chaos, confusion and smoke filled civil war battles, plus a solider would have to work in the trajectory of the new rifled musket longer than 100 yards. Various combat effects reduced the performance of the musket in civil war combat. Terrain ,smoke, visibility and stress reduce performance. The smoke alone on battlefield could hide large formations. A major reduction was lack of practice by the average solider and understanding of the muskets trajectory [see training]. So that what a solider could do in combat vs the specs of the musket, were far apart from each other. Most all casualties happened within 100 yards or less, some long range firing happened 200 yards plus, but often with little effect. Causalities were caused from 30-75 yards from musket fire in prolonged battles. Even than the loses were not always great, In a battle that lasted 4-5 hours at less than 100 yards, a union units total loses were just 50 wounded/killed. Most commanders avoided indecisive long range firefights, they did not want to waste ammo and would only allow their soldiers to shoot at 150 yards or less, some would wait for 50-70 yards to first open fire, and on some occasions 30 paces. Only experts and trained shot would attempt over 150 yards such as snipers. The French following the Crimean war removed long range sights from their rifle musket seeing it largely as a waste of ammo. Only specialized, trained skirmish and sniping soldiers took advantage of the rifles increased range. As the war progressed after years of high causalities and drop in motivation made longer ranges more often, and soldiers less likely to assault. -[ Keep in mind This is were the first shots were fired, often the combat would end up 30-70 yards as one side advanced or charged]. Mark Grimsley calculated a average range for the entire war of 116 yards, he said smothbore was 80-100. Brent Nosworthy said “critical engagement” 80-120 yards. The rifle performed very similar to the smothbore in its effectiveness in battle. Americans were viewed as generally good shooters at the time compared to Europeans. Napoleonic rates of shots fired to casualty was around .5 to .6%. Americans using the same weapons [smothbore] in mexican war caused a causality at a rate of .8%. The civil war ratio of small arms shots fired to causality was .68 to 1.5%, about 1 causality for every 100 shots fired. At Gettysburg an average of 200 rounds were fired for one casualty, that is equal to Napoleonic times. Historians such as Allen C Guelzo calculated even lower numbers of 1 casualty for every 250-300 shots fired. The civil war musket could be loaded in practice in about 30 seconds by most well drilled soldiers. But just as with accuracy and range, in combat was not as impressive. There were 17 movements needed in the manual to load a musket properly to fire. Doing this with the noise, confusion, fear and other distractions of battle was no easy thing. In the heat of battle soldiers loaded their musket multiple times yet without firing a single shot. One gun was found loaded 23 times at Gettysburg. Other mishaps such as unopened cartage, ball behind powder etc were common and lead to misfires. Of the 24,000 muskets at Gettysburg retrieved by the north, half had 2 rounds and 20% 3 or more rounds loaded one had 20. 10% of muskets became unsuitable in combat. Misfires could be as high as 25%. Commanders would conserve ammo in case of a charge from the enemy and fear of losing their ground. Units only brought enough ammo to last 30 min if they were to reload every 30 seconds. So while waiting for ammo, they would conserve it and slow the rate of fire.The rate of fire for entire units averaged 1 round per 2.1 min [included some breach loaders]. The slowest rate recorded was 1 shot fired every 4.6 min, the fastest recorded was 1 shot every 30 sec. Breach loaders averaged 1 shot every 12 seconds. Often faulty weapons, and lack of ammo had much to do with this. Many believe that the weapons of the civil war [The rifled musket] was a great improvement over the smothbore and this led the older Napoleonic linear tactics outdated and the reason for high causalities and the eventual entrenchments of late 64 and 65. That the generals of the civil war were slow to change the old ways and used outdated tactics. This is rejected now by many historians. The only aspect were the rifled musket changed civil war tactics was in sniping and skirmishing, the only places that the new musket was able to realize its full advantages. These changes happened early in the war on both sides, both sides were fast to change tactics when the rifled musket changed warfare. The generals who were in the battles, trained with the weapons and saw the results, also were in the best position to determine the correct tactics. They chose Linear Napoleonic tactics. Many now believe the rifled musket was not a vast improvement in combat over the smothbore and that is the reason the Napoleonic tactics were still used, still effective, and the best tactics to win the engagement. Historian Allen C Guelzo argues The gunpowder of the time produced a great deal of smoke when fired. battles began with artillery firing for some time, and skirmishers had been firing at each other for some time. By the time the main lines of infantry began approaching each other, visibility was significantly obscured. Once the infantry began the main engagement, visibility quickly was reduced to almost nil. One solider from the 1st Minnesota wrote home the smoke “did not permit us to see anything clearly... we directed our fire at red flashes through the smoke.” Another solider said “The atmosphere was black with the smoke of battle...there was scarcely telling friend from foes.” Lack of viability due to terrain and smoke often causes friendly fire. With the lack of visibility, only massed infantry fire was effective, and this reality is reflected in the tactics of the time. Guelzo argues that rifling only truly benefited the sharpshooters on the skirmish line, who fought before their visibility was obscured, but the main line of infantry could not take advantage of the benefits of rifling. Under the stress of battle, virtually every infantryman asked about aiming on the battlefield replied that in practice, the best one could do was "simply raise his rifle to the horizontal, and fire without aiming." Eyewitnesses report entire companies aiming their rifles at a 45 degree angle facing the sky and discharging their rifles at Bull Run. Such untrained soldiers could not be expected to engage an enemy much further than point blank range with any level of accuracy. Thus Guelzo doubts that contemporary military leaders blatantly ignored technological advances. Rather, generals did not alter their tactics not due to ignorance, but because the battlefield had not changed substantially from the Napoleonic era. What other tactics could be used? Snipers and skirmishers were “brushed off” the battle once the main lines came into play. Any unit alone would be overwhelmed by firepower and if not connected in a line or had its flanks unprotected would than be flanked by devastating fire. Skirmishers could not be counted on to take and capture and hold strategic sites. Sending multiple small units in various directions would just lead to defender getting first volley and causing high causalities and a retreat. You had to mass men in large numbers in a attack to withstand volleys from the defender and counter with high concentrated fire. Or to keep up the pressure until the enemy gave way or out of ammo. Even when in a solid formation Individual fire was ineffective against solid lines of advancing enemy it was also more inaccurate. “Volley fire was always more accurate than individual fire because it was supervised” Individual fire just pecked at the enemy formation but volleys had the power to cause panic and crush the morale of the enemy, causing a retreat. At this battle somewhat early in the war smoothbores were not all the uncommon on both sides. The confederates had the high ground and a stonewall to shoot behind. They also had all there best shots shooting while passing back muskets to men lying down undercover behind the wall, who than reloaded and handed back loaded weapons. This tactic enabled the south to keep up a rapid fire of their best shots in each regiment for the entire engagement. Despite all this, the union actually did make a breakthroughs in the line, but General franklin with his 50,000 troops, failed to send in his men when he should have, and confederate general Jackson counterattacked and pushed the north back. Bad leadership also doomed the attack from the start as the attack was generally carried out by one brigade at a time and union troops often received friendly fire in the back. All the confederate artillery were placed where they could fire across the entire field at all advancing soldiers. So when advancing the union men were hit from every angel. That battle had the largest % of causalities for either side in a major engagement from artillery fire. 50% of union losses were from artillery. Artillery normally made up around 6-12% of causalities. Artillery, not the rifled musket caused the devastating causalities of the north. When artillery fire was not dominate such as when the union attacked Prospect Hill. Losses were 3,000 CSA and 3,100 USA despite the advantage of the hill and woods for the defenders. The confederate line was temporarily broke but Burnside sent no more reinforcements focusing his attack elsewhere. But the losses for the north were around 12,500 For the south around 5,000. Given that half of the causalities reported were from artillery fire, that would bring northern causalities from the rifle musket and smothbore musket, to a total of 6,000-6,250 against the confederates on the high ground behind a stonewall with only best men firing a rapid fire. Hardley a example of a vast advantage of the musket in defensive combat. Than compare with Chancellorsville a few months later. The south were more outnumbered in manpower than at Fredircksburg. Yet they won the battle by a maneuvering flanking attack. The losses for the north were around 17,000. For the south around 13,000. So being attacked the north lost 4,000 more men at Chancellorsville, at fredricksburg they lost 7,500 more. Not a drastic difference given the circumstances of the attack and artillery fire at fredricksburg. Frericksburg would later be taken by frontal assault during the Chancellorsville campaign. Generals and military training manuals of the day, had units spend a great deal of time drilling and cleaning their weapons, yet target shooting was almost non existent in the civil war, target practice was“all but ignored.” There was no course in the entire united states to train men with the new rifle musket before the war. Even at the end of war 1865, there was only 50,000 federal soldiers in the federal army, the rest were state volunteers. Typical officers were citizens soldiers with no more training than the average soldiers. They spent time drilling and working on maneuvers and soldier life. Often men were involved in multiple battles before ever shooting their weapon for practice. During The 24th Michigan's only target practice, 3 men were wounded and 1 was killed. The commander's reason for not practicing was “Live fire was almost as dangerous to the men who were delivering it as the enemy.” The 35th mass never held target practice for fear of other soldiers in the army reaction to live fire in the camp. However it was usually lack of ammunition that made target practice rare or non existent. Because of this, live firing long range target practice was almost non existent in either army. The 13th mass formed in august 61, had there first target practice in the spring of 64 after fighting in 6 battles. Even as late as 64 a large portion of the union army was not familiar with their weapons. General Meade ordered 10 rounds target practice for all units in the spring of 1864 “To familiarize men with their weapon, It is believed numerous men have been in combat without firing their guns, guns filled to muzzle with cartilages.” In General Bragg's army of Tennessee not until the summer of 63 was the army given basics in loading and firing. The rifled musket bullet took trajectory upward passing above human level and needed special training to account for the trajectory, the smothbore did not. Yet Training schools did not start until the after the war. Men were simply told to “aim low” or at the knee to offset upward kick back of their weapon. This led to many soldiers unable to shoot with accuracy. As a example Around Vicksburg 25-26 June 1863 at a distance of 15 steps volley after volley were fired, with no causalities on either side. In open terrain a full volley given at 75 yards caused not one single hit. Some battles that lasted half a hour at 100 yards and less yet caused no causalities. As calculated by Paddy Griffith the success achieved by the attacker, of the major 25 battles of the civil war vs Napoleonic wars. Lack of success in attack had more to due with morale, bad commands, lost orders, loss of ammo, unable to push forward due to exhaustion, generals not following orders, unclear orders, smoke and lack of vision, noise, and confusion all effected major attacks rather than the impact of the rifle musket. It was much easier to coordinate defensively over miles on the larger civil war battlefield's than coordinate a successful attack. For example in 1865 five orders were received by one unit, all contradictory. Lack of viability and confused when pushing into enemy territory alone caused many attacks to slow or fail. Local attacks that were successful were than often countered by fresh troops attacking and retaking the ground, thus the “Attack” failed. As the war progressed after years of high causalities drop in motivation made longer ranges more often, and soldiers less likely to commit fully to a assault. Veteran soldiers were less willing to die, more careful, and less enthusiastic after years of fighting. Men forced into service in drafts were also less willing to die for the cause. However the success rate of the attacking army in the civil war compared to the attack % success was close to Napoleonic times[slight lower]. In Europe 1859-71 multiple attacks won major victories using the same tech as the civil war. Even frontal assault's on highly fortified positions could and were successful till end of war. Some battles that were declared won by the defender, were actually won by the attacker. For example Shiloh day one the south attacked and won a great victory. Day two the north was reinforced and attacked the south, they won a great victory. Both days the attacker won, yet the “defender” [ the union] won the battle. Multiple battles were won by large counter attacks by the defender such as second manasas. Defensive terrain also effected the outcome. Most battles were fought either in the dense Forrest of Tennessee or near Virginia's forests and many rivers. The terrain of the south offered numerous positions easy to defend giving the defender the natural advantage. If we are to accept the assumptions that General Lee was the greatest defensive general of the war. That the army of northern Virginia had the best soldiers and equipment the south had. Maybe even that Virginians defending their home state fought the hardest. Than all of these could play a factor in defensive success in the civil war. Most of the major battles won by the defender, were when lee was defending Virginia. Reserves of fresh troops were kept to block advancing enemy and allow the defeated army to retreat safety, thus reducing lopsided victories. Unlike in many wars such as the mexican/american war when a line was broken, the whole army would retreat. In the civil war reinforcements would simply be sent to plug the whole. The massive size of civil war armies made it near impossible to defeat an entire army. The few that were Nashville and Appomattox were smaller sized civil war armies. Constant close combat, not the rifle musket caused late war entrenchments. When general Grant took command he set out to be in constant fighting to drain the south of manpower. The close contact the armies from mid 64-65 led to entrenchments and fortification just as would happen in a smothbore war. During smothbore wars massive entrenchments would occur when armies were in prolonged contact such as sieges. The constant sniping and skirmishing that took place forces men into cover. Combined with the souths losses in the first years of the war and their need to defend key locations such as Richmond, also led to entrenchments. When Atlanta and Richmond were taken, maneuvering warfare started right back up. Early in the civil war entrenchments were also used before the rifled musket became widely used. In the Franco-Prussian war 1870-1871 that involved higher weapon tech [repeaters carbines etc] maneuvering warfare dominated with only light fortifications on a few occasions. Entrenchments were frowned upon by many generals at the time because soldiers behind entrenchments could not form up fast for counter attacks and are less likely to leave their protection. At Chancellorsville part of what led to the 11th corps destruction was the men could not form up in time to react to Jackson flank attack. Also The best one could do is a stalemate. Carbines ran out of ammo fast, were expensive and needed more supply wagons. The early repeaters were unreliable with many unable to shoot, cost effective muzzle loader was better to produce over breach loaders. The south could not produce them in any large number and the north, because of the cost and use of ammo, did not give them to standard infantry. Generals believed [and it happened] that soldiers would waste ammo with carbines and not take careful aim. Instead they wanted the relabel cheep musket for the infantry solider. With the musket time was taken to aim and reload. However some soldiers were allowed to pay for their own if they wanted one. Shermans army had more breach loaders than any other army. But they were a small minority still. However they were not always relabel. On may 1864 1st Pennsylvanian fired only 12-18 rounds per man per hour. In combat “Repeaters caused similar causalities to musket.” They were also less effective at long range and because of use of ammo they could not hold a position long. It is said because the rifled musket was more deadly, that led to higher causalities during the civil war. However smothbore battles led at times to even higher % loss of man in battles. The average loss in a major battle in the civil war was 9.8% Federal, and 14% confederate. The highest on either side for one battle was confederate loses at Gettysburg 30%. Compared with some Napoleonic smothbore wars and battles that is not massive. The civil war was likely a slight decline over the french revolution. The French Prussian wars losses were greater than the civil wars equaling 27% and 28%. Here are some major European smothbore battle loses. Zorndorf in 1758 37.5% losses for the Prussians and 50% Russian. Last edited by 1stvermont on Sun Oct 16, 2016 8:41 pm, edited 1 time in total. Ha, I always said ACW is the end of napoleonic wars style era. edit: oh, Griffith already wrote it in 1987!.. Paddys book is error prone, from midd use of sources to conclusions that cannot be arrived at from the data sets he providez, so use caution with his book. Hess otoh is first rate. The author you really ought to use is Brent Noseworthy his Bloody cruicible of courage, and his other work on the Napoleonic period. Black powder makes for a dirty barrel, which makes muzzle-loading a rifle incredibly annoying. The only time I actually put lead through my Enfield it got fouled very quickly, such that I barely got 10 rounds through in 30 minutes. Just the fear of an accidental discharge makes one trepidatious about working hard to ram it home. Add to that the propensity for the soft lead minie balls to become deformed and thus not fit very well. On the field, it is difficult for my company to fire 3 rounds per minute, and that is without even touching the ramrod. Studies by the army had already shown that smoothbores firing buck 'n' ball delivered more hits than minie balls from rifles at usual combat ranges, and understandably units like the Irish Brigade preferred the old .69 caliber Springfields. Considering that there is basically no recoil from a p1853 Enfield, I can't imagine that recoil kept soldiers from "upgrading." The real advance from earlier conflicts was not rifling, but percussion caps. Army testing showed flintlocks to have a misfire rate about 55%, which percussion cut in half. Doubling the volume of fire in this way probably increased the effectiveness of small arms. Other subsequent research has focused on advances in artillery as being more important than rifled small arms in the casualties of the Civil War. I would have to argue that repeaters could have a significant tactical effect, even if not employed on a large scale strategically. Wilder's brigade was particularly conspicuous in the Tullahoma and Chickamauga campaigns, where they were basically able to be employed as shock troops and rout much larger Confederate formations. Similarly-armed Federal cavalry in the Overland Campaign often took advanced positions and held until relieved by larger infantry numbers. Rapid-firing guns did require a larger investment both up front and in maintenance, as you say, but this often paid off on the battlefield. PS- "musket" refers to a smoothbore long-arm; rifling was sometimes added to the barrel post-production, creating a "rifled musket." A long-arm built with rifled barrel, such as the '61 Springfield and the '53 Enfield, is simply a "rifle." One might say that hardware are the bones over which tactics form the muscle, sinew and flesh of a strategy. The English square that had defeated Napolean fell prey to the Zulu charge. This did not result in modern armies adopting the spear in place of the rifle. Napoleonic tactics died with the invention of the breechloading "needle-gun" twenty years before the CW. The genius of Lee and Grant simply ignored this. If your strategy is to save money on ammo, then a musket is better than a repeater. If your strategy is for a soldier to stand and die next to his peers, then you won't want him to get used to fighting with a breechloader in the relative safety of the prone firing position. So you employ tactics that justify your strategy. Of course, the verdict of military history is that armies train their soldiers to use rifles and fight prone because to do otherwise would be incredibly incompetent. Interesting subject. I wouldn't be suprized if the combat distance for massed formations remained stable at around 100 yards or less, simply because of visibility issues. However, the range and accuracy changed the game in skirmishing. Skirmish formations became more and more used as the war went on. Because of spacing and a low rate of fire, smoke obstruction was limited and marksmanship encouraged. In a way, all modern US infantry tactics evolved from skirmish drill. (The basic skirmish team was a team of two who advanced, or fell back, in bounds--on man moves while the other remains in an over-watch position--which is not unlike "buddy fire" drills that are taught in Basic Training today). By the end of the war, many a major attack was preceded by a "thick skirmish line," and all that long range fire gave insensitive to go to ground in entrenchments. At Friedland in 1807 the French gunners commanded by Senarmont opened fire at 400 m from the Russians, but after 5 or 6 shots from each gun they advanced alternately to about 200 m. So precarious did this advance appear, indeed, that Napoleon is reputed to have thought they were deserting. When the gunners were 200 m from the enemy they fired about 20 times, still with roundshot. Their next step was to move the guns forward until they joined together at about 60 m from the enemy! A rapid fire with canister was then sufficient to shot to pieces the stubborn Russian infantry in front of them ! Kevin Kiley writes, "Increasingly after 1807, massed artillery was brought forward rapidly into canister range in order to 'blow away great sections of the enemy's line' and thus to seek a quick decision. This tactics was pioneered by Senarmont at Friedland in 1807, and was used to good effect at Ucles, Ocana, and Somosierra in Spain, as well as by the great 102-gun battery commanded by lauriston at Wagram in 1809, which not only covered a tactical corps change of front but preceded Macdonald's famous attack that shattered the Austrian line. The best example of this tactics, however, was undoubtedly Drouot's artillery attack at Lutzen, in which his 80-gun battery completely blew the center out of the Allied line, paving the way for the decisive assault of the Guard. Further examples occured at Hanau, at Ligny, and at Waterloo, as well ay Raab in 1809. Gray Fox wrote: One might say that hardware are the bones over which tactics form the muscle, sinew and flesh of a strategy. The English square that had defeated Napolean fell prey to the Zulu charge. This did not result in modern armies adopting the spear in place of the rifle. Napoleonic tactics died with the invention of the breechloading "needle-gun" twenty years before the CW. The genius of Lee and Grant simply ignored this. If your strategy is to save money on ammo, then a musket is better than a repeater. If your strategy is for a soldier to stand and die next to his peers, then you won't want him to get used to fighting with a breechloader in the relative safety of the prone firing position. So you employ tactics that justify your strategy. Of course, the verdict of military history is that armies train their soldiers to use rifles and fight prone because to do otherwise would be incredibly incompetent. Grey Fox, I wouldn't be too dismissive of Lee and Grant and their contemporaries for "missing" the tactical implications of new weapons. Skirmishing order (dispersed infantry, using cover etc) got used more and more in the ACW, but the main thing holding back a big change was communication. When you have just drums, bugles, yelling and runners, you are limited in just how much you can disperse people before loosing unit cohesion and command and control. Truly modern infantry tactics only really started to emerge in the 2nd half of WWI, when you had reliable radio sets for the battalion level, and even then carrier pigeons were often more reliable. You didn't get radios at the platoon level until WWII. In comparison, the best Lee or Grant had was the hard-line telegraph. I believe that the Prussians used breechloader tactics in 1866. The CW was fought with outdated tactics. Gray Fox wrote: I believe that the Prussians used breechloader tactics in 1866. The CW was fought with outdated tactics. A bit off topic, but here is a nice little article on Franco-Prussian tactics. The French had the better rifle in fact (the Chassepot bolt action rifle), but the Prussians had better steel artillery with reliable impact fuses. In any event, Prussian infantry assaults were still close order mass formation affairs. They just had a superior combined arms doctrine and the artillery necessary to support the attack. You really don't see a movement away from mass formation tactics until the extremely innovative Brusilov offensive of 1916! WBTS Union was 4 rounds a day per field gun. Franco/Prussia had a 2 to 8. Interesting neh? My point is that the CW was fought with poor tactics that were outdated. The tactics supported a similar strategy. Of course smooth bore muskets are fine if you expect to fight like Wellington and Napolean. Just ignore any experience over the last four and a half decades of military history. Even minor corrections to these tactics, like the use of skirmishers to disrupt a defense so that the offensive line could double time quickly to the objective were ignored. Lee at Gettysburg and Grant at Cold Harbor hardly displayed the genius they are given by history. If both sides threw rocks and used clubs, then obviously no one would overlook the incompetence of what happened. So obsolete weapons were used with antiquated tactics in the ridiculous strategic hope that a line of men won't be shot to pieces before they can cross an open field. I'm just trying to make the point that there were other factors that prevented a more "modern" style of infantry tactics C3 being a huge one. Take Spotsylvania as an example. Emory Upton came up with a very good way of assaulting defensive positions (dense formations targeting weak points that assembled in nearby covered positions. His attack on May 10th was very successful in capturing the defensive line and its defenders...the problem was that it was unsupported and was beaten back by counter attacks. Two days later, Grant had Hancock's corps attack in the same fashion and it crushed the mule shoe in 30 mins, taking 5,000 CSA prisoners with light losses. The problem was that in the course of the assault, units got all mixed up, command and control was lost and the stalled without being exploited. That gave Lee time to counter attack, and the whole thing broke down into a bloodbath. Agreed, some Generals did amazingly well...considering. Tactics may succeed in spite of themselves. However, no one had control over the whole picture. Smooth bore muskets, bows and arrows were winning battles because lucky leaders never had someone like a Guderian to show them what to do. To quote pgr, "I wouldn't be too dismissive of Lee and Grant and their contemporaries for "missing" the tactical implications of new weapons." I say to that, "We are the chorus. We agree. We agree." It is often said that Civil war tactics were out dated. And when it comes to riffled muskets and artillery, that statement holds up. But what about command issues? Were CW tactics outdated there? When peering into the past, we need to be careful. Modern experiences can taint our judgments. In these days of satellites and radios, only a tiny fraction of officers have tasted the mass of communication problems faced by those fighting past wars. Dispatch riders, bugles and drums or bellowed orders only take you so far. It’s no surprise that for thousands of years, commanders chose to fight in massed blocks and lines. When initial plans failed to survive contact with the enemy, how else was control possible? Even the most talented of officers will find it difficult to control and direct men dispersed in small packets across vast distances. The problem could be stated as how do you apply the greatest force at the weakest point when you are herding cats? In this light, it is easy to see why dense formations lasted until they became a form of mass suicide in World War One. Poor decisions weren't made due to a lack of satellite imagery. Someone decided that muskets were just as good as repeating breechloaders because of the monetary cost to supply ammo. That's why so many smoothbore muskets were used. Heaven knows, you don't want your side firing too many bullets at the enemy from the now possible prone firing position. What might that get you? The Union might allow cavalrymen to do that, but we don't want to win the war too quickly. If you choose obsolete weapons, then you are stuck with the only (antiquated) tactics that make those work. Remember, the U.S., north and south, was a land of innovation, from the telegraph to ironclads, balloons and submarines, just not on the battlefield. Really stubborn, entrenched incompetence also kept the Union from correctly using massed artillery for the first two years. The four years of war may have cost less in ammo, but the cost to the nation's young men was 600,000. Gray Fox wrote: Poor decisions weren't made due to a lack of satellite imagery. Very, very true. But, I think the conversation has veered off into the direction of two radio stations playing different tunes in the same room. The point I was trying to make was, even though weapons had made great leaps forward, other than the hard wired telegraph, communication was still mired in the old, old ways. And thus commanders, who wished to retain battlefield control, had no choice but to retain dense and massive formations in the face of greatly increased fire power. The answer to this problem and the birth of modern infantry tactics was not found until the Russian Brusilov Offensive and/or Willy Rohr’s Stormtrooper tactics using a decentralised fire control and tactical command system. Well Grey Fox, sounds like you should direct your fire at someone in the quartermaster's department! (And I would tend to agree!) Of course, not to make excuses for the folks that thought they would just "waste ammunition," there were some serious practical problems as well. Repeating rifles were still pretty new. The lever action Henry rifle just couldn't be produced in mass quantities (1864 saw the peak in production at 290 per month, they only made like 8,000 during the war). Same thing for Spensers to a degree. It took a massive industrial effort on the union's part just to produce enough rifled muskets to field a million man army. If you want a bright spot for tactical evolution, look to the union cavalry. By 1865 they were fully armed with repeaters, skilled at fighting dismounted in "open order" (like skirmishers, using cover firing prone etc), and under a guy like Sheridan, they could do wonders. Give the guys some credit for the fact that they had the good sense not to do massed, Napoleonic style, cavalry charges against prepared infantry. The popular conception is that Civil War tactics were outdated, because generals repeatedly fell back on tactics that relied on direct mass infantry assaults. I don't think this belief is entirely incorrect, but it's overstated. Overwhelmingly, attack plans focused on flanking or diversionary actions. All the major bloodbaths involved direct mass assaults, but nearly all of those were not supposed to be the primary attack. They became the primary attack when faulty intelligence failed to put the attackers on the defender's flank, or when poor staffing infrastructure and lack of communications technology prevented the diversionary or supporting attacks from being supported. This loss of control was deadly when the intended flank or diversionary attack misfired, because there was very little that could be done to adapt the battle plan to the reality of the battlefield. By the way PGR, Forrest did use artillery in advanced, offensive deployments at Brice's Crossroads. It was on a small scale and didn't catch on, but it's worth noting as part of Forrest's tactical foresight. as icons for their military genius. Do we have the ability to examine the war with cool heads and cooler hearts? If not, then Lee is the greatest General in U.S. history (stand while you read that) and Grant is the genius who figured out how to finally defeat him. Well...sort of. Generals really hate military geniuses. Billy Mitchell was court-martialed. Hart, Fuller and Guderian were ignored or slighted by their General Staffs for proposing Combined Arms tank armies. A CW General was instructed to use a line of infantry under close scrutiny from their officers to fight a battle. That is exactly what he must do. Lee, Grant, Jackson, etc. did that really well too, amazingly well...considering. The manual taught that your soldiers should fire three times a minute and not thirty. Smooth bore muskets fit that tactic turgidly. How can we expect any of these American Napoleans to have proposed anything different? After all, you don't have to improvise or be innovative or brilliant, you can fall back on the proven use of a great maneuver and attack an unguarded flank...with your line of musketeers. If the combatants had used pointy sticks, then eventually someone must bravely exclaim, "Dude!". That would extend to the officers that contracted for pointy sticks. Also to the officers that purchased them, as well as to the one who wrote a field manual for the use of pointy sticks. Finally, even to the General that brillianty led his army of men with pointy sticks to out-flank someone who should never have been given a command. Somewhere between Gettysburg and the Somme, those officers should have become extinct, not icons. The Prussian von Moeltke thought that the CW was two armed mobs chasing each other for four years without accomplishing anything of importance. Well Phil Sheridan wasn't too impressed with Moeltke either concerning the Franco-Prussian war that he observed. I may, in conclusion, say that I saw no new military principles developed, whether of strategy or grand tactics, the movements of the different armies and corps being dictated and governed by the same general laws that have so long obtained" - - Phil Sheridan as reported to General Grant. The needle-gun proved to have numerous defects. Its effective range was very short compared to that of the muzzle-loading rifles of the day, and conspicuously so as against the Chassepot. A significant amount of gas escaped at the breech when the rifle was fired with a paper cartridge, neutralizing the advantage gained from the novel front-ignited powder charge. An improved model, giving greater muzzle velocity and increased speed in loading, was introduced later but soon replaced by the Mauser rifle. The breech would fail to close entirely after several shots due to the lack of an effective obturation seal. This caused the gas escaping from the breech to burn the skin of the soldier. Soldiers could not aim accurately without burning themselves and were forced to fire from the hip. The placement of the primer directly behind the bullet meant the firing needle was enclosed in black powder when the gun was fired, causing stress to the pin, which would often break after as few as 200 rounds had been fired and render the rifle useless until it could be replaced. Soldiers were provided with two replacement needles for that purpose. Then you should consider quantity and availability. Muzzleloaders and Smoothbores were what was on hand. Everything else was limited quantity or in a prototype phase. Spencer's were the most widespread issued repeaters, and only around 100,000 could be produced by 1865. Even if the War Department had the foresight to adopt the Spencer Rifle as the standard Infantry weapon (and I agree that "wasting ammunition" is a horrible reason not to adopt a technology), it's far from clear that Spencer the man could have delivered on the contract. Rifle Muskets were a known technology, and the technology could be scaled up quickly. Something like almost 2 million 1861 and 63 Springfields were produced in the same time frame. Now I did come across an article on evolving Calvary tactics that you might enjoy Fox. In particular, the role of James Wilson in transforming the US Calvary, both in developing new doctrine and tactics, and for being the man who took the decision to have the Spencer issued as the standard Calvary weapon for US forces. It's probably no accident that he was the youngest General in the army and better able to think out of the box than his older superiors. As for Molkte, I think he would have had a rough time with a US army of 1865-6-7, armed with Allen trap-door conversions (1866 Springfields), Spencer armed cavalry led by someone like Sheridan, and Gatling gun batteries. Why were smooth bore muskets which had been used in the Wars of Napoleon, still used a half century later? If the Union had been a banana republic and the CSA had no access to the industry of Europe, then this could be excused. However, this was certainly not the case. Didn't it have something to do with a lack of vision, unpreparedness, and complacency, coupled with American military philosophy? The pre-war military was tiny, scattered, and decentralized. The federal army's only enemies were the various Native American Nations, most of whom were largely peaceful in the years leading up to the war and, in any event, did not pose an existential threat to the United States. West Point was oriented towards training engineers, and many of its graduates were not expected to make the army a career; many did not. Furthermore Americans were hostile to the idea of a professional army. State militias, operating independently from one another and with no federal oversight, did things as each saw fit. Finally, no one anticipated having to arm hundreds of thousands of soldiers. All of these factors worked against military innovation, investment, and standardization. There was no need, and no will. When the war began, all these problems became exposed as the states, who generally left it up to non-professional commanders, armed their regiments. A great example of how this all comes together is the famous 69th New York of the Irish Brigade. The 69th was a militia unit organized into federal service, led by first by Michael Cochoran and then by Thomas Meagher, neither of whom were formally trained officers. Meagher intentionally gave the 69th the "Buck and Ball" because he believed its short range would complement the Irish's supposed tendency towards aggressiveness and charging. The 69th carried the horribly obsolete Buck and Ball through at least Gettysburg. And in other cases, there was of course the difficulty of arming hundreds of thousands of men, which no one had anticipated. Even given all that, smoothbore muskets were replaced as quickly as possible by both sides. Did breech-loaders become the standard? No, but by the end of the war there weren't many men who didn't carry at least a rifled gun. Do Americans get emotional about their generals? Yes, and there is a tendency to overrate some. But the condition of the prewar army and its preparedness shouldn't be held against them. Most of the men who rose to high command during the Civil War were not high ranking officers before it, and many were not even in the army when the war began; a handful never had been. In any event, the structure of the American military, the Army's mission, and American attitudes towards the military all worked against adopting and standardizing technology. The number produced is not the same as the number used, there were arouund 5,000 Sher,mans built that the governmnet never purchased. More important is how many were issued. Acquisitions in the (long) first year. (ref)http://digital.library.cornell.edu/cgi/t/text/pageviewer-idx?c=moawar&cc=moawar&idno=waro0123&q1=ordnance&frm=frameset&view=image&seq=866 Note 30k manufactured in USA against 0ver 700k imported. I've read all the references cited except Paddy Griffith and there's still some things I don't understand. Perhaps this diverse and learned forum can enlighten me. I'm not a shooter. 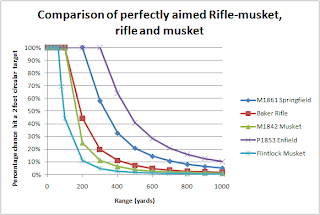 My understanding is that rifle muskets were accurate at 300m, or at 100m, but the shot would go over the head of anyone in between those ranges because the rifle had a lower muzzle velocity than the smoothbore and thus a higher trajectory. This implies that the rifles had fixed sights, set at 300m at the factory. I think I've seen (or seen photos of) Enfields and Springfields with elevating sights. I have a Civil War Enfield and it has no rear sights, nor any sign that they were ever present ("...level your piece toward the enemy..."). I know these rifle muskets were very effective in the hands of soldiers trained to estimate range and adjust their sights. Most soldiers in the Civil War were not. Considering the average engagement range established by the cited references, it's hard to see how the rifle musket made a big difference over the smoothbore except in the hands of specially trained soldiers. As for breechloaders, I'M afraid I have to side with hanny1. The early ones, especially those that used paper cartridges, were very unreliable. I remember reading that cavalrymen complained about the cartridges disintegrating into a mass of paper, powder and shot on campaign. Early copper cartridges didn't extract well and were replaced by brass. The Spencer was a reliable weapon, but I question whether production of the rifle/carbine and especially the ammo could have been increased enough to make any more of a difference. As for ammo wastage, that's silly. Rapid fire from repeaters was devastating against a frontal assault, but a waste of ammo in a skirmish. So, teach the soldiers fire discipline. EDIT: We've all read the personal accounts and know that soldiers were exhorted to "aim low". I always assumed that this was because company officers knew from experience that rifle muskets shot high at intermediate ranges. Maybe the battle most used to say that frontal assaults were less successful and the rifle musket changed combat was at Fredricksburg. However that battle took place over long open terrain and all the confederate guns were placed where they could fire across the entire field at all advancing soldiers. So when advancing the union men were hit from every angel. That battle had the largest % of causalities for either side, in a major engagement from artillery fire. 50% of union losses were from artillery. Artillery normally made up around 6-12% of causalities. At this battle somewhat early in the war smoothbores were not all the uncommon on both sides. Also The confederates had the high ground and a stonewall to shoot behind. They also had all there best shots shooting while passing back muskets to men lying down undercover behind the wall, who than reloaded and handed back loaded weapons. This tactic enabled the south to keep up a rapid fire of their best shots in each regiment for the entire engagement. Despite all this, the union actually did make a few breakthroughs in the line, but Gneral franklin with his 50,000 troops, failed to send in his men when he should have, and confederate general Jackson counterattacked and pushed the north back. But the losses for the north were around 12,500, For the south around 5,000. Given that half of the causalities reported were from artillery fire, that would bring northern causalities from the rifle musket and smothbore musket, to a total of 6,000 -6,500 against the confederates on the high ground behind a stonewall with only best men firing a rapid fire. Harley a example of a vast advantage of the musket in defensive combat. Than compare with Chancellorsville a few months later. The south were more outnumbered in manpower than at fredircksburg. They won the battle by a maneuvering flanking attack. The losses for the north were around 17,000. For the south around 13,000. So being attacked the north lost 4,000 more men at Chancellorsville, at fredricksburg they lost 7,500 more. Not a drastic difference given the circumstances of the attack and artillery fire at fredricksburg. I'm interested in why the rifle didn't revolutionise combat in the Civil War, as per Griffith etc. ; here are some thoughts. Using a ballistic coefficient of 0.145 for the Burton ball and the calculator here I've calculated the ballistic arcs of the 0.58 Springfield rifle-musket. 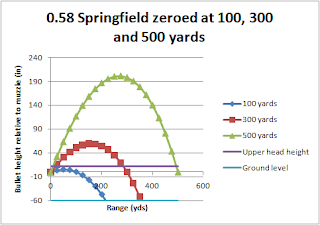 Figure 1: Springfield with sights set at 100, 300 and 500 yards. -60 inches is the approximate ground level (edit: as Fred points out below, there was no real "zeroing" of the weapons, and is sloppy nomenclature on my part). The purple line is 12 inches above the bore and the turcoise line at -60 inches is approximately the ground. When the arc is between these two lines it may hit a target. The default 100 yard sight setting means that the bullet describes a single dangerous space out to roughly 200 yards (assuming the musket is approximately 5 feet above the ground, i.e. shoulder height, if the shooter is prone the bullet strikes the ground roughly at 120 yards). Set at 300 yards we get the pattern described in Fred Ray's recent blog post. At 500 yards setting the round is out of the dangerous space around 10 yards into flight, and comes down on a step plunging trajectory with a very small dangerous space of about 50 yards. As an aside, these arcs are not symmetrical, the round is accelerating towards the ground in them. 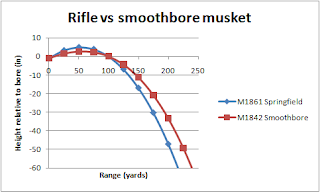 If we make a comparison with the smoothbore musket then we find that if both are zeroed at 100 yards there is no significant difference, both are still in the dangerous space out to about 200 yards. The superior muzzle velocity of the smoothbore beats the superior ballistic coefficient of the rifle. This of course ignores the fact that the rifle bullet will disperse less and is effected by wind only around a third of the ball. For firing at picked targets on the skirmish line the rifle will be better at 200 yards. If firing at a massed target (i.e. a battleline) there is essentially no difference. At around 100 yards there is little discernable difference in whether or not the target is hit. Figure 3: Chance of hitting a 2 foot target. "Effective range" was reckoned on the 20% hit line. This shows that, ignoring the problem of rangefinding and wind effects, the Springfield had 3.5x the range of an old flintlock, and twice the range of the percussion musket it replaced. It also shows that the Confederate were right that the Enfield was a far more accurate weapon. In fact this accuracy was never achieved for the Springfield due to concerns over loading; after only a few rounds the barrel would become so clogged that the .58 bullet could not be loaded, the Ordnance bureau started supplying the 0.57 bullet for the Enfield as standard, which increased windage (and ease of loading) at the expense of accuracy. Figures 1 and 3 must be considered together, and can be summed (which I won't do here as it is a lot of work). Firing at a target 225 yards away with a Springfield is difficult, you must set your sights at 300 yards, then aim below the targets feet, awkward when poorly trained soldiers naturally shoot high. The solution adopted for the line infantry of the US, CS and also most of continental Europe was to set sights at 100 yards, and only shoot at 150 yards or less. Sharpshooters, jaegars, chasseurs and other specialist troops would be trained in the full use of sights and long range shooting. Only the British would stick to training their line infantry to shoot at long ranges. The above was the work of 67Tigers, i would add that yu can glean a lot of insightlful info from the casualty reports of the AoP, for instance survival rates from calibre of wound, which we propably instinctivly know, is that a.69 round had the lowest survibility rate. Gosh, I'm always astonished by the quality and level of knowledge of some threads on this forum !